A strong site search is critical to success in eCommerce. The tools and functionality that EasyAsk provides, gives us confidence that our customers will find the gifts they’re looking for quickly and easily. Personalization Mall is one of those sites where the shopper’s experience is everything. When shopping for gifts that will be cherished for years to come, the buyer wants to have the same positive experience when making their purchase as their recipient has when they receive the gift. Personalization Mall’s shoppers are on the hunt for that perfect, personalized keepsake gift that will be treasured for years to come. PMall wants to be sure to provide them that gift quickly, regardless of how the shopper asks for it. If the search engine offers intelligent and intuitive natural language search, the shopper will get much more accurate results. How the shopper searches should be up to them. Prior to implementing EasyAsk, PMall was using a homegrown keyword based system that was not providing a satisfying search experience for their shoppers. It was just not smart enough to handle the challenge of customers entering more than just one keyword. Because EasyAsk has a cutting edge semantic engine, it is able to interpret synonyms as well as provide a greater understanding of word nuances such as pluralities and tenses. PMall saves time on product keyword assignment since they entrust EasyAsk to better understand the relationship between similar keywords. This means that regardless of what word the shopper uses, the engine returns what the shopper wants. This limits the need to explicitly tag each product with every possible keyword variation – an added bonus, since the Merchandisers have less work to do maintaining the system, they can focus their time elsewhere. Merchandisers are able to use the tool to improve user experiences for non-product queries entered into the search field, too. By defining searches related to common questions like shipping rates and catalogs, they are able to direct customers more efficiently to the answers they need. 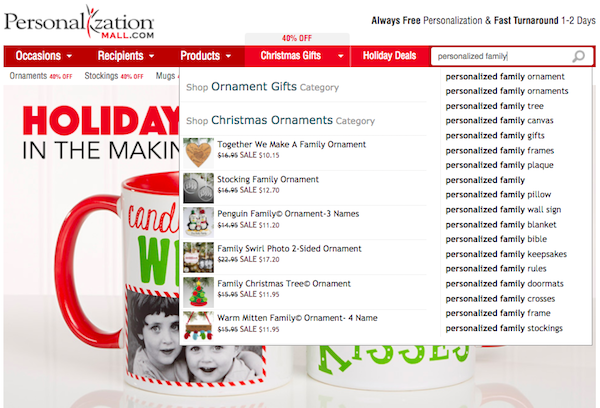 Sales on the PersonalizationMall.com website were burgeoning and PMall needed a search solution that better understood their catalogue and provided more accurate results to their shoppers. With over 14,000 active skus in 700 categories and over 200 product types in their catalogue, PMall needed a high performing solution to quickly process data and return accurate search results. 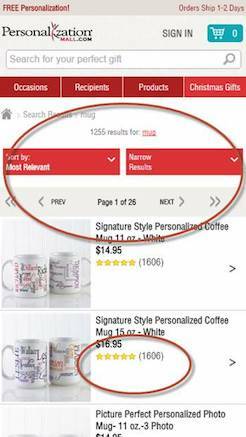 Because of EasyAsk’s understanding of such a rich catalogue and its ability to index the data within every field in the catalogue, PMall can create navigational attributes to help their shoppers. 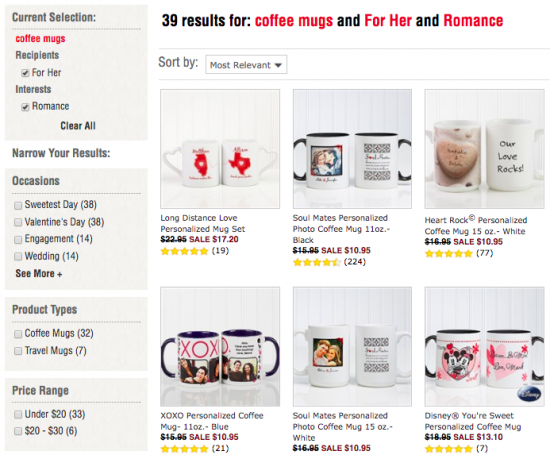 Offering multi-selectable options, shoppers can quickly and easily drill down to find that perfect gift. Additionally, because of EasyAsk’s ability to streamline the indexing of their catalogue, PMall saw the performance they wanted in the memory cache index. This in turn provides their shoppers with fast, reliable and accurate results, every time. Shopping trends change from year to year and without strong analytic capabilities, a website can quickly grow static. PMall found their homegrown system was not providing them with the data they needed to make educated decisions regarding shopping trends. This critical need for analytical data was necessary to keep the website fresh by providing insight into the minds of the shopper. Because of the limited navigation space offered on smartphones and tablets; search, as opposed to navigation, is even more important on a mobile device. PMall has noted that their mobile conversion rates have been increasing faster than desktop conversion rates, which is reducing the gap between the two. They attribute this both to their internal optimization efforts, improvements in device functionality and increasing comfort and familiarity among customers with their smart devices. Because EasyAsk provides the right results on the first page, mobile users are much more likely to make their purchase. Scrolling past the first page to find what they are looking for is a sure way to send your potential shoppers off to your competition. Whether using the search bar or using talk-to-text, Personalization Mall and EasyAsk ensure that shoppers find what they want whether they are searching on a big or small screen. EasyAsk is a well-featured highly scalable search engine, that allows us to integrate a high performance search capability into our system seamlessly. For the past 6 years, EasyAsk has shown complete reliability with minimal maintenance needed. Since implementing EasyAsk, PMall has seen a site conversion rate that averages around 2-3x the industry average. With its flexible implementation, seamless integration and high performance, EasyAsk’s eCommerce search solution has given PMall’s shoppers the ability to efficiently find the products they’re looking for, which is a critical element in sustaining that success. PersonalizationMall.com was founded in 1998 with headquarters located in Burr Ridge, Illinois. Their goal is to serve their customers by making personalized gift buying quick and easy. Their revolutionary preview technology takes the guesswork out of personalization, by allowing you to see what your gift will look like, personalized with your details, before you buy it! EasyAsk is an Enterprise class solution with some of the largest eCommerce properties on the web as their clients. Based in Burlington, Massachusetts, EasyAsk has long been a leader in eCommerce shopping software, The North Face, Timberland, Journey’s, Personalization Mall, United Notions Aramark, TrueValue, and Harbor Freight Tools, just to name a few rely on the EasyAsk software products to run eCommerce operations daily.